It's the 550HG and Griptilians... and they have evolved for this year. Benchmade Knives's Griptilian feature hollowground blades and ambidextrous round thumb-hole openers. It&apos;s the 550HG and Griptilians... and they have evolved for this year. Benchmade Knives&apos;s Griptilian feature hollowground blades and ambidextrous round thumb-hole openers. This blade shape has no point on the tip, very little to no belly and the spine of the blade curves down to meet the edge. It is used in applications where slicing is the main requirement, and a point is either not needed or would actively get in the way. Emergency rescue blades are usually of this design. The lack of a point prevents the rescuer from inadvertently injuring a victim who is being cut free from something restrictive. 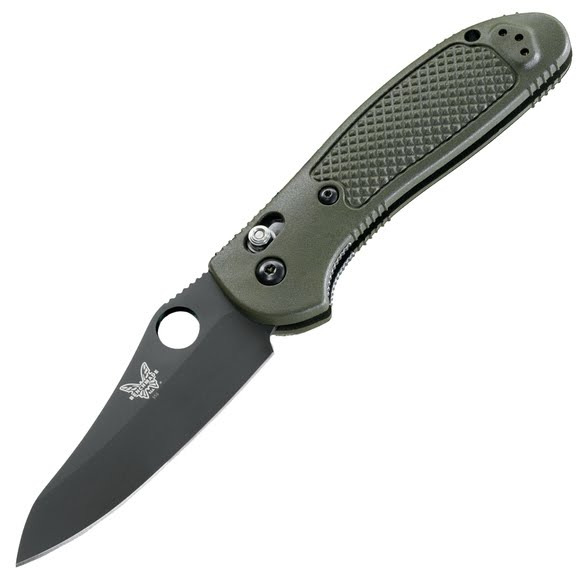 A patented Benchmade exclusive, AXIS has been turning heads and winning fans ever since its introduction. A 100-percent ambidextrous design, AXIS gets its function from a small, hardened steel bar which rides forward and back in a slot machined into both steel liners. The bar extends to both sides of the knife, spanning the liners and positioned over the rear of the blade. It engages a ramped, tang portion of the knife blade when it is opened. Two omega style springs, one on each liner, give the locking bar it&apos;s inertia to engage the knife tang, and as a result the tang is wedged solidly between a sizable stop pin and the AXIS bar itself.